What are those special things kept by Vatican? First of all, it is proud of the great collection of sculptures. Calculated by historians, in the territory of 0,44 square kilometres there are 1400 rooms, 20 museum yards which store more than 60 thousand works of art. In total, the chambers of Vatican resemble Dante's Divine Comedy. There one can trace the history of formation of the first canons of beauty, the fight of faith with human, and most importantly - the emotions of suffering, first love, longing, ecstasy and eternal bliss. First of all, make sure that no arrogant guide is next to you. Second, check your pockets if you have already bought some tourist mementos unwittingly while being bored by standing in the queue. If you have not made these two "sins", I can easily predict that your first impression from Vatican will be a stunning surprise. Before your eyes, there is a sparkling golden ball, a true modern sculpture with creative cracks. "It would match very spacious rooms the Museum of Modern Art (MoMA) or the entrance to the Georges Pompidou Museum, but not Vatican!" , you would say. However, the object is not so simple. In the early 90’s the Holy See led by Pope John Paul II came to the conclusion that Vatican would have to be modernized, because millennial eyes of sculptures were looking in a rather languish way at the third generation of visitors. Then it was decided to find something modern, but with a deep philosophical meaning. 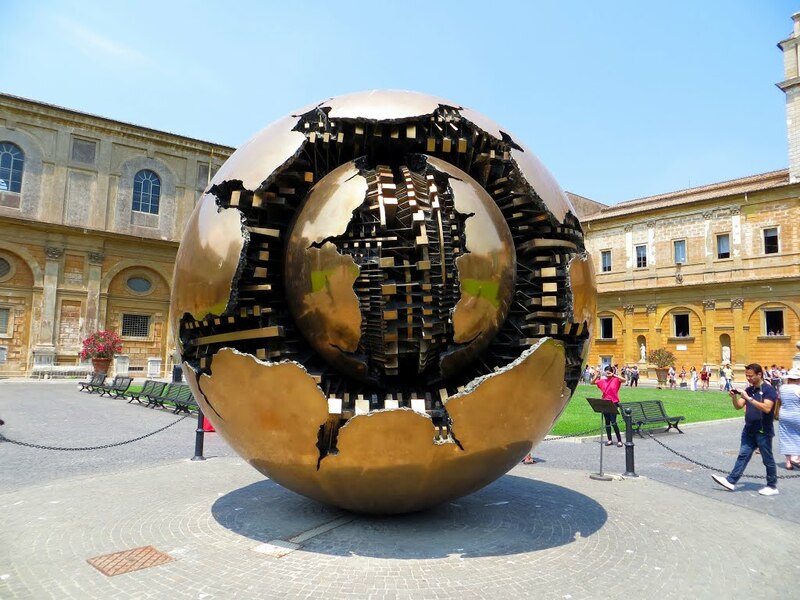 They saw a right concept in Arnoldo Pomodoro’s sculpture The Sphere Within Sphere (Italian, Sfera con Sfera): everyone who looks at copper ball, may see their role in the destruction of the world. These creative cracks symbolize annihilating forces of man. 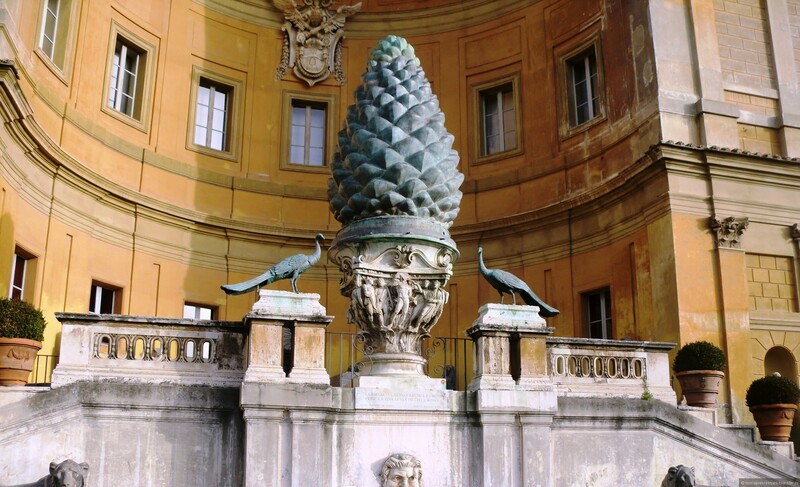 This modern sculpture is followed by another Vatican’s surprise: a fir-cone or Italian Pigna. Initially, this sculpture identified an allegory to the creation of the world and was the star attraction of the Paris Champs de Mars two centuries before the construction of the Eiffel Tower. In 1608, the Italian Government decided that the sculpture with all its soul and body tells about Rome more than about France, and transported the bronze fir-cone with peacocks and bas-reliefs of the head to the Vatican, closer to the Belvedere Palace. The Belvedere Palace is the cultural epicentre of the Apostolic Palace, the residence of the Popes. Why "Belvedere", do not try to guess. Its walls keep the sculpture of perfectly shaped Greek solar and light deity, the famous Apollo Belvedere. Nevertheless, the most remarkable exhibit which like a magnet pulls tourists to bow their heads in order to study bodies in the coils of the ancient serpents, is the sculpture of Laocoon And His Sons in a niche of the Pio-Clementino museum. It is rather funny to watch visitors dancing next to it, but more exciting is a story telling that in 1506 an ordinary farmer Felice de Fredis was digging his vineyard in the suburbs of Rome. It was during this laborious procedure, when he came across the marble. Thank God, at that time, even ordinary workers understood the value of art. Mr. de Fredis was not at a loss, and immediately called young Michelangelo who helped him dig sculpture out and bring it into presentable appearance. Nowadays Laocoon still enjoys success with visitors. When entering the Pio-Clementino museum, one can be easily taken aback by number of marble bodies. "My lifetime is not enough for all that…", would be the first words everyone utters. The exhibits have been accumulated there for over five centuries. Some were brought by the Popes only in order to enhance the luxury of their own, and some objects were the last memories of feelings of the great Roman emperors. This category includes two statues: Antinous, custom-made under order of the Roman emperor Hadrian, and Aphrodite of Cnidus by the sculptor Praxiteles. First was madly loved by the emperor who forced the young man to be by his side all the time. After Antinous could not resist a strong man's love, he committed suicide. The emperor not only created more than a hundred of his sculptures to remember, but even dedicated the city of Antinopolis to his sweetheart. Aphrodite of Cnidus was adored by everyone. Rumour has it that this is one of the most protected sculptures in the pontifical collection. Not only because it is the first image of the naked body in the Greek culture, but also due to a belief that the statue is able to bring love and good fortune. Aphrodite's body is covered with stains and abrasions, as each brisk tourist tries to touch the body of the Cnidus beauty while unseen by security guards. The theme of ancient culture is also revealed in the Chiaramonti museum. It was created by the Pope Pius VII a hundred years after the Pio-Clementino museum in the early 19th century. "It must be luxurious." so ordered the Pope to the architect Stern. His request was fully fulfilled. Long halls, arches, and most importantly, more than 800 exhibits including sculpture of Greek mythology and Roman history. 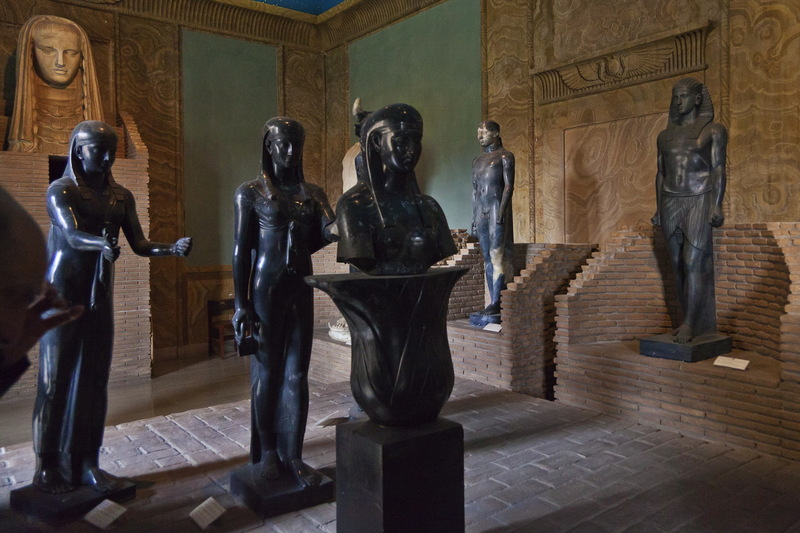 The powerful interior of the hall is enhanced by Alexandrian colossus of the first century BC the Nile with sixteen infants. When in 1513 the statue had been found on the site of a Roman temple of Isis, the Pope Pius VII insisted that it was immediately moved to the Palace of the Popes, as hoped, that the sculpture would be the hallmark of improving diplomatic relations between Rome and Egypt.This stone creation did not became the final point of love of the Pope Pius VII to the Egyptian culture. Throughout his reign from 1800 till 1823 the Pope was collecting sculptures of cats, Pharaohs’ heads and all the other objects of overseas art. As a result, they became so numerous that in 1839, the Pope Gregory XVI decided to open a separate Gregorian Egyptian Museum in Vatican. 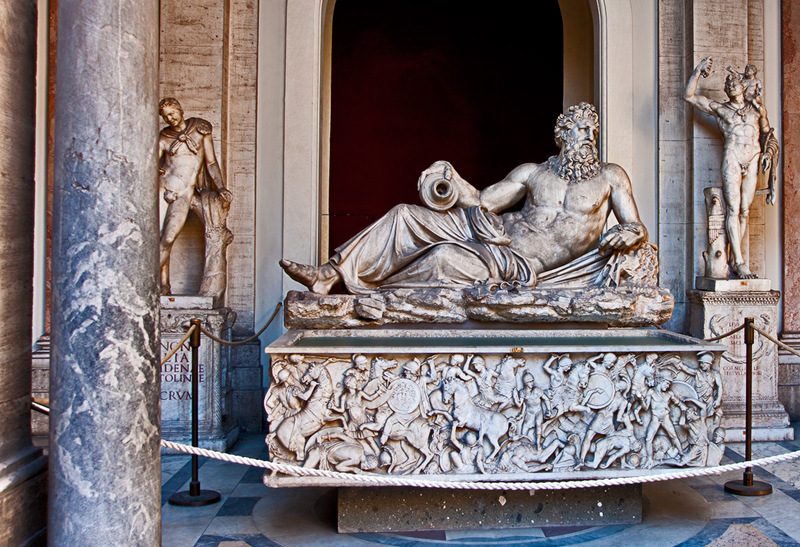 Now, historians are convinced that sculptures in Vatican were much more numerous. And the only thing that ruined beautiful marble bodies of gods and goddesses, was envy and complexes of the Popes. Thus, from time to time in the halls of the Vatican Museum, you can see beautiful male and female images with broken faces evidencing a whim of the Pope Sixtus VI, who was convinced that beauty could provoke lust. There is nothing to tell about the violent Great Castration of the Pope Pius IX, since traces of his "reign" can be seen far beyond Vatican. We can be satisfied only by those masterpieces that have managed to survive both rebellious times and heydays. He made up his name to be one of a kind. Riot of his selfhood became the basis for enormous artistic heritage while architecture demonstrated the possibility to combine ecological compatibility with modern technologies. We would catch the last warm autumn sun rays at almost empty Warsaw Sunday streets. When the sun had hidden behind the skyscraper - we got high on the tallest among them to enjoy the sunset. Today, OUTLOOK will give you a tour at the place where it is impossible to get an ordinary person! Words we vocalize every day seem ordinary and familiar to us. We even get the feeling that, for instance, the word “chauffeur” existed forever. There is only this slight nuance: cars themselves re a little over hundred years old… Hence, things aren’t that simple when it comes to our day-to-day vocabulary. Well then, why not recollect interesting stories of other words origin?